Sometimes carving pumpkins is just a bit too messy and honestly, I always have grand ideas such as this one, which never end up going quite the way I had planned (no surprise there). I have seen so many no-carve pumpkins pop up on Pinterest, that I really wanted to have a go at my own to avoid the mess and inevitable disappointment of my overambitious carving attempts! I decided to create a trio of designs which work well alone, but especially so together. The theme I chose was 'graphic copper', using inspiration from interior decor that I've been lusting over recently. 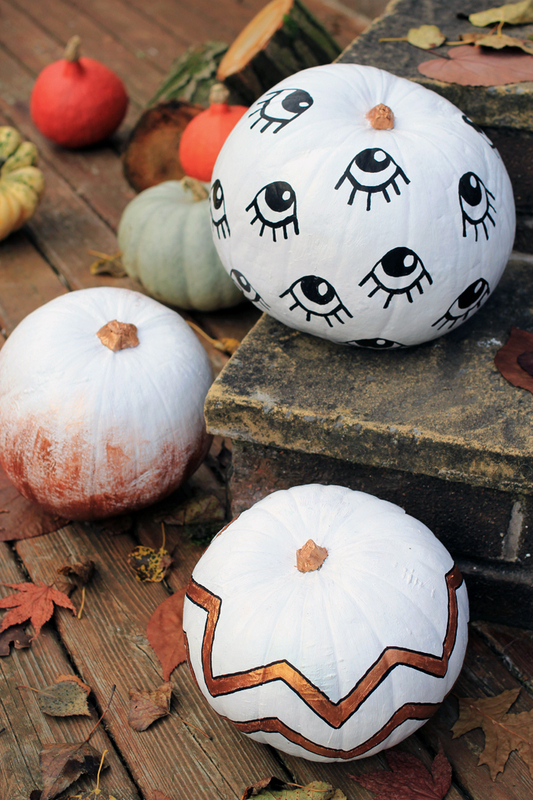 Spray each pumpkin with white spray paint to fully cover the orange colour. I used acrylic paint as spray paint gives me horrible sickness headaches, bit of a wuss I know. I wouldn't recommend using acrylic as it takes ages to dry and peels off if you scuff it, but I worked with it anyway. Once dry, paint the stalks with copper paint. 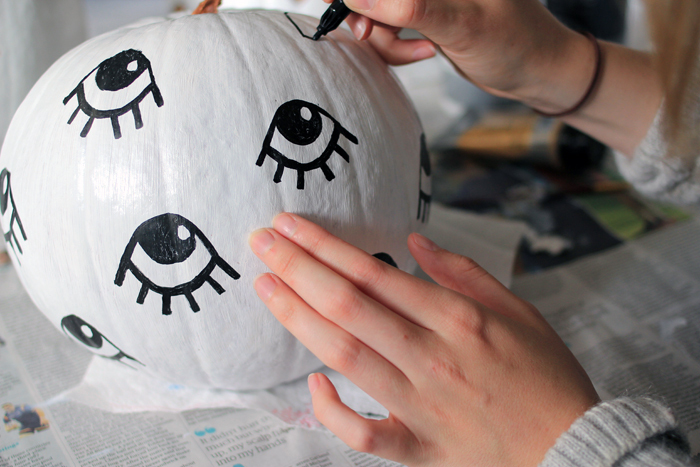 For the eye pattern, use the paint pen to create the basic eye shape, kind of like a pointy-ended rugby ball. Draw on 6 eyelashes on the bottom of the eye and then a pupil from the top of the eye, coloured black leaving space for a white circle on the top right. Repeat around the rest of the pumpkin. For the chevron pattern, brush on the copper paint using as little water as you can get away with, as watered down paint will run. 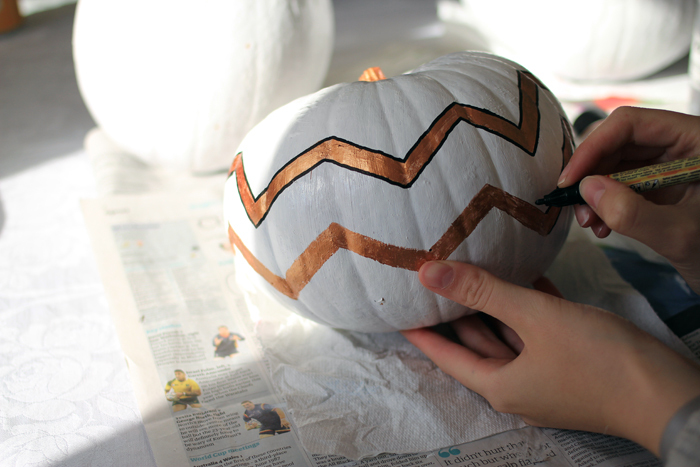 Start at the top third and create zigzags around the pumpkin. Leave an inch or two gap in between and follow the same shape as above. Once dry, line the edges with the paint pen. 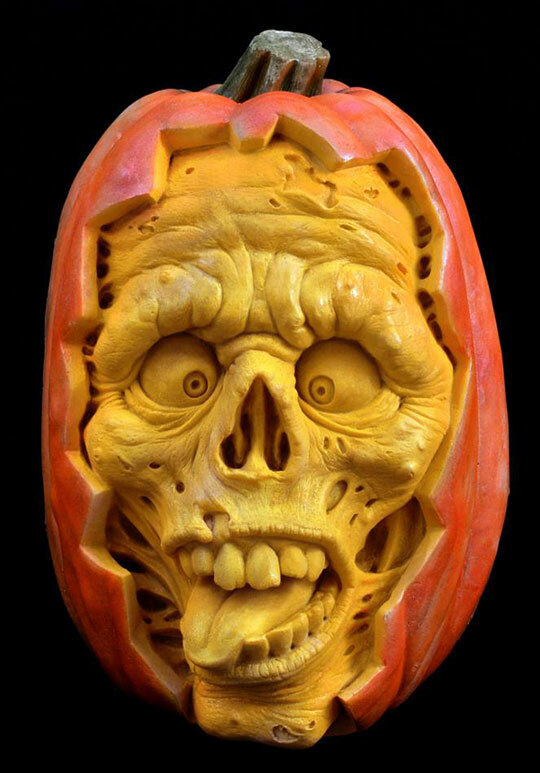 The last pumpkin is created using a dry-brush technique. 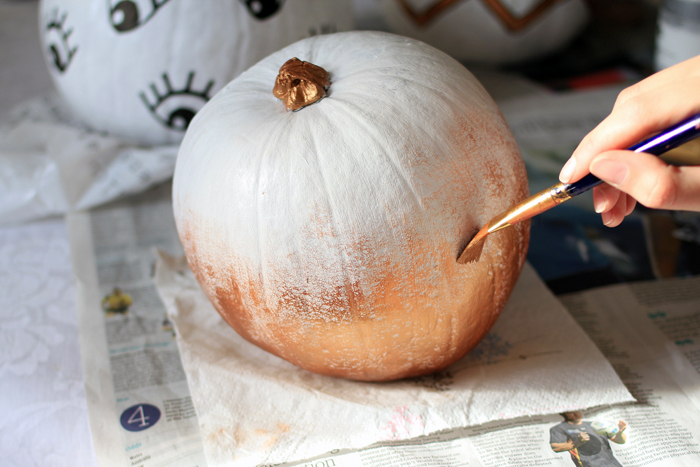 Turn the pumpkin upside down and paint the base with the copper paint. Then using a fairly dry flat brush, paint in upwards strokes. This should allow the texture of the pumpkin to show through underneath. Repeat this all the way around. Once it is dry, you can flip it back over and add a little bit more paint if desired. I particularly loved styling these because of all the rich copper, orange and warm brown tones. I was going to photograph them against a white wall, but the nature-lover in me couldn't handle it, so outside they went! This also feels like a slippery slope to being a crazy lady who goes a little too far with the Halloween decorations, as I'm already thinking of other designs I want to make closer to the 31st. My poor little house will be bursting! 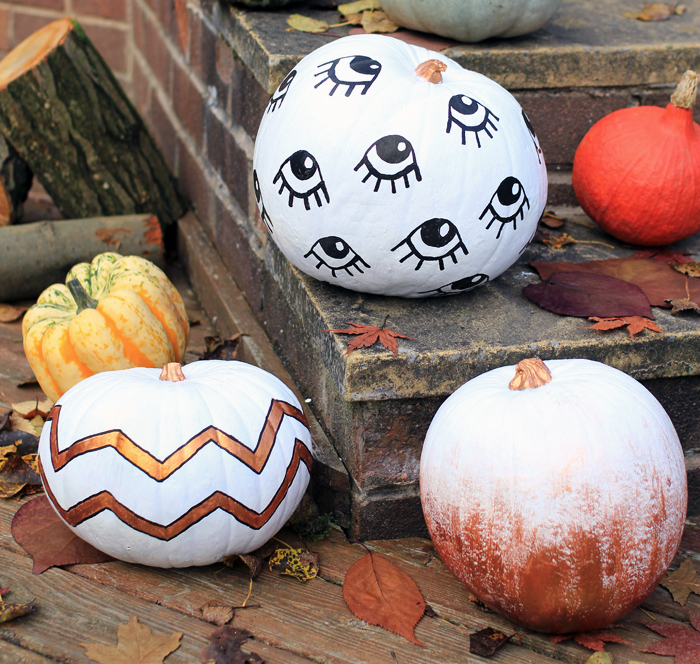 Do tweet me if you have a go at any of these designs as I would love to see and if you're interested you can see my other Halloween posts here. These are so cool! I live in the dorms at my university and we're trying to plan something to decorate pumpkins and I think this is perfect! Thanks for sharing! Oh my gosh, this is such a great idea! And to be honest, looks more aesthetically pleasing to the eye than carving them!